Facebook is the social network which allows people to communicate all over the world.While people chat with their best buddies on Facebook.But in few countries and few internet connections have slow net where they can’t open another webpage other than a single site.So keeping this mind some of the desktop facebook chat app have been arrived which makes users comfortable.A brief explanation about facebook messenger for windows and their exclusive features. Ftalk is a Facebook instant messenger desktop application which allows users to chat with their Facebook friends on desktop without logging in.It is mainly useful for slow net users. This applications starts automatically and you can chit chat without facebook login in browser .Not only chatting , you get all notification on your desktop.As you need not open webpages in your browser to look in for notifications. Also you get notified when your friends come online.And you can also update status right from the application.And you get notified when your friends come online.Different smiley facebook chat emotions can be utilized and have fun with friends with this application. Facebook Messenger for Windows is the official program from Facebook that allows you to chat with your Facebook friends from your desktop. but also gives you access the news feed and message notifications and access the all facebook messages , add requests,messages etc.Download Facebook messenger for pc from official site itself. The interface of Facebook Messenger is divided into two separate windows. One is dedicated to contacts and newsfeed like the right column of Facebook and the other opens Facebook chat download.If any notifications appear as pop-ups on your desktop. 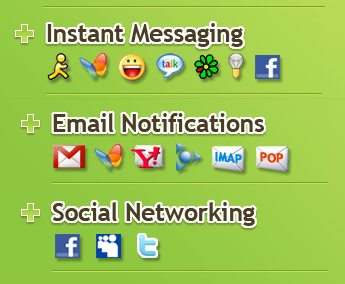 Digsby is the desktop chat client for many social networks like AIM, MSN, Yahoo, ICQ, Google Talk, Jabber,Twitter, MySpace,LinkedIn and Facebook chat.You need not open all your networks to get connected with your pals, partners,relations etc.